Police in Cape Verde seized nearly ten tonnes of cocaine and arrested 11 people on a Russian vessel docked in the capital, police said, in the largest single drug haul in the island country’s history. An Atlantic archipelago of 500,000 people off Africa’s west coast, Cape Verde has long tried to tackle gangs trafficking Latin American cocaine to Europe via West Africa. The 9.5 tonnes of cocaine were seized overnight after the ship, travelling to Morocco from South America, docked at the port of Praia for legal reasons following the death of a crew member, the judiciary police said in a statement. 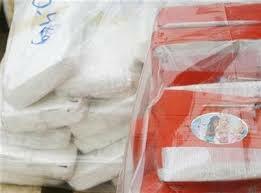 Photos provided by police showed dozens of brick-like packages wrapped in plastic and cloth sacks at the port. The police said they were alerted by the Maritime Analysis and Operation Centre – a platform co-ordinating anti-drug trafficking actions of seven E.U. states – who suspected the ship of transporting illicit substances. The 11 arrested are Russian nationals. The use of substances like cocaine, heroin and amphetamines is rising in West Africa, where countries that once served primarily as transit points for trade between South America and Europe are now active consumer markets. Despite strict drug laws, the quantity of cocaine seized in Africa doubled in 2016, according to the UN Office on Drugs and Crime (UNODC), making it the second-highest growth in cocaine seizures after Asia. In Cape Verde authorities intercepted 1.5 tonnes of pure cocaine destined for Europe in 2011 and seized 280 kilograms of the drug from a Brazil-registered fishing vessel in 2016 as it prepared to transfer its load to a US-flagged yacht. Global cocaine production reached 1,125 tonnes in 2015, said UNODC, of which a record 864 tonnes were seized that year.